I wanted to make a couple of snacks this weekend. it’s a busy sports time of year with the baseball season going, football season just starting, college football underway, NASCAR entering the chase and more, so there are plenty of good things for you ro watch. If you have some friends over for the game and want to make a couple of quick and easy snacks, these two are perfect to give a try. The first is a very easy vegetarian nachos recipe that you can whip up in just a few minutes. Preheat the oven to 350 degrees. Coat a large baking sheet or a large pie plate with nonstick spray. In a saucepan over medium, add 1 tablespoon of vegetable oil and the black beans and chopped onion. Saute until the beans are warmed through and the onion is soft, about 2 minutes. Place a layer of tortilla chips on the sheet and cover with a layer of beans and onions and then cover with cheese. Repeat the process to make a second layer. Bake in the oven until the cheese is melted, about 20 minutes. Top with salsa, guacamole, cilantro and sour cream. 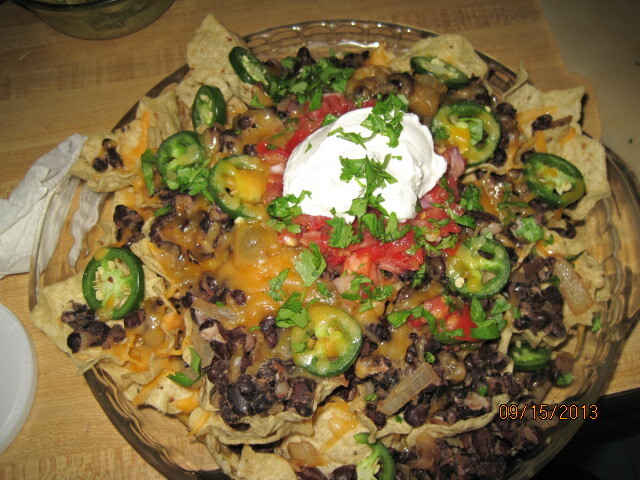 You could make these nachos with some beef or pork if you happen to have some on hand and ready to use, but you can just as easily throw it together without them and then they are suitable for anyone who is staying away from meat to eat. You could always vary the toppings and add more or less of what you and your guests like best to make a great snack. It’s always good to have a good dip on hand and what is better and more liked than an onion dip? Naturally, you could simply used the dry soup mix that many people use with some sour cream or yogurt, but using fresh ingredients tastes so much better and has a lot less sodium and preservatives. This one is really easy to make and you can alter it up a little bit to make it even easier. I altered the original recipe somewhat from Bon Appetit to make a little bit of a smaller batch. In a large skillet over medium-high heat, heat the olive oil until shimmering. Add the onions and shallots and saute until soft, about 8 minutes. Season with salt and pepper. Add the sprigs of thyme, the white wine and the Sherry vinegar and saute until the liquid has evaporated and the onions and shallots are well caramelized, about 6 minutes. Remove the skillet from the heat and discard the thyme sprigs. Allow the mixture to cool. Transfer the onion mixture to a large bowl. 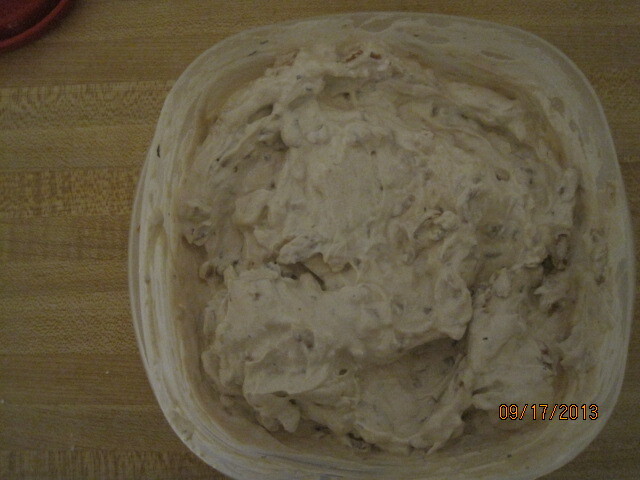 Stir in the sour cream, yogurt and onion powder until the mixture is well blended. Season with salt and pepper to taste. Cover and chill the dip until ready to use. The original recipe roasts the onions and shallots in the oven for well over an hour. If you have the time to put in and want to do it that way and get a deeper, richer flavor from the onions then you may want to give it a try. If you are pressed for time and want something faster but still tastes better than anything you can buy, give it a try with my method. Everyone thought the results were pretty good from what I made. That’s all I have for today. Check back next time for another recipe. I do have a couple of things to post, including the first soup of the fall season that I made last night. Check back for that one. Until next time, enjoy the rest of your day and enjoy your meal!